A nutrient is a chemical or substance that an animal requires to live and grow. Nutrients can be found in food, synthesized in the body, or taken in from the environment. Nutrients that must be consumed in the diet because the animal cannot produce them or cannot produce them in sufficient quantities are considered essential nutrients. Those the animal can synthesize to meet its needs or does not need from the diet are considered nonessential nutrients. Water is a critical nutrient that many people overlook. Water makes up more than half of the body mass of a rabbit. An animal’s water requirements change depending on environmental temperature, humidity, and activity level, among other factors. A typical rabbit may consume approximately 10 milliliters of water per 100 grams of body weight (8 teaspoons of water per pound of body weight). This means that a 5-pound rabbit consumes at least 40 teaspoons of water a day. This is a very high water intake for an animal of this size. Water must be available at all times for the rabbit to reach this intake level. Nursing rabbits require an even higher water intake to meet needs for milk production. Insufficient water intake can lead to dehydration in rabbits. Rabbits may pull water from their gastrointestinal tract to prevent cellular dehydration. This results in drier than normal gastrointestinal tract contents, which can cause blockages or gastrointestinal stasis—conditions that can be fatal to rabbits. In addition, rabbits with lowered water intakes may be more likely to develop urinary stones or crystals. Rabbits get some water from the food they consume. If you use commercial rabbit feed, which tends to be low in water, supply water in a bowl or bottle to meet your rabbit's needs. Some studies have shown that rabbits drink more water if it is provided in a bowl than in a sipper bottle. If you provide water in a bowl, ensure that the water is kept clean and does not get contaminated with stool or food. Change or provide water daily to ensure a clean, consistent water supply. Animals require proteins in the diet for both essential and nonessential amino acids. Examples of essential amino acids for rabbits are lysine, methionine, valine, leucine, and isoleucine. Rabbits use lower quality proteins than humans. Bacteria in a rabbit's colon produce protein (in the form of more bacterial cells), which the rabbit can use to meet its nutrient needs by practicing cecotrophy (consumption of select stools rich in protein and bacterial cells). A rabbit’s protein requirements increase during times of growth, pregnancy, or lactation (milk production). Protein needs are lowest for adults at maintenance. During this time, excess protein can cause a rabbit's kidneys to overwork to filter out waste products caused by protein breakdown in the body. Rabbits have relatively low fat requirements. Rabbit diets should contain around 3 percent fat, but can have slightly higher fat levels during lactation. Vegetable oils in the diet provide fatty acids that can improve the sheen (glossiness) of the rabbit’s coat. For show rabbits, supplementing the diet with small amounts of vegetable oil (a teaspoon or less) can improve their appearance for show. Fats also increase the energy content of the diet without adding simple carbohydrates that can have negative effects in the gastrointestinal tract. However, you should limit the amount of fat in your rabbit's diet to prevent obesity. Obesity can cause health problems and decrease reproductive performance of rabbits. Carbohydrates are the major components of plant material. The varied carbohydrates found in plant material are categorized based on their structure and how they are utilized in the body. Carbohydrate types include sugars, starches, and fiber. Some carbohydrates, such as simple sugars, are easily digested in the mammal’s gastrointestinal tract. Starches make up a large proportion of seeds, grains, and tubers. Starches are used for energy storage in plants and provide an energy source to animals. Some starches are digested by mammalian enzymes. Fiber is composed of carbohydrates found in plant material that are not digestible by mammalian enzymes. Fiber is broken down only in the gastrointestinal tract. Bacteria found in high concentrations in certain organs in the tract, such as the cecum of the rabbit, break down fiber. Bacteria are able to digest or ferment the soluble fiber fraction and are not capable of fermenting the insoluble fiber fraction. Soluble fiber serves as a key energy source to the bacteria and results in increased bacterial cell growth. The breakdown of soluble fiber by the bacteria results in the release of short chain fatty acids (SCFA). These SCFAs are then used by intestinal cells for energy, providing health benefits that can lower the risks or symptoms of some diseases, such as colon cancers or gastrointestinal disease. Insoluble fiber, on the other hand, is not able to be fermented and is passed in the stool. Insoluble fiber plays an important role in keeping food moving through the gastrointestinal tract, improves satiety (feeling full after a meal), and prevents constipation. Rabbits require high amounts of fiber in their diet to prevent gastrointestinal disease and to provide a substrate for fermentation in the cecum to produce bacterial cells as a source of protein and B vitamins. Rabbit diets should contain a minimum of 14 percent fiber. The fiber amount may be higher in the diet of adult rabbits. Rabbits, like humans, require a number of different vitamins. These vitamins can be divided into the fat-soluble vitamins (A, D, E, and K) and the water-soluble vitamins (B complex and C). Vitamins are required in small amounts by the body, and each one has its own function in the body. Lack of any one vitamin in the diet can cause deficiency symptoms or illness, while excesses of some vitamins can also be toxic. Meeting the rabbit’s vitamin needs is relatively easy with a good quality diet. Rabbits meet their B complex vitamin and vitamin K needs through cecotrophy. These vitamins are produced by the bacterial populations in the cecum of the rabbit. By selectively eating the cecal pellet produced by the bacteria, the rabbit is provided all of the vitamins it needs. Often, these vitamins may also be found in commercial diets for rabbits. Vitamins A, D, and E should be provided in the diet. The rabbit’s requirements for vitamin D and E appear to be low and are met with a good quality diet. The appropriate vitamin A content of a diet depends on the life stage of the rabbit. Both a deficiency and an excess of vitamin A result in similar signs related to poor reproductive performance. These symptoms in breeding rabbits include low conception rate, low survival rate of offspring, and fluid on the brain of the offspring (hydrocephalus). Toxicity may occur if vitamin A is supplemented to a high alfalfa diet because alfalfa contains large amounts of the vitamin A precursor beta-carotene. If you have multiple cases of hydrocephalus in your breeding herd, have a veterinarian test liver and diet vitamin A levels to determine whether you have an excess or a deficiency. Choosing the appropriate diet for the life stage of your rabbit will prevent vitamin imbalances. Consult with your veterinarian before adding any supplemental vitamins to the diet. Animals require about 22 different inorganic elements, known as minerals, in the diet. These may be required in relatively larger amounts (macrominerals) or relatively smaller amounts (microminerals or trace minerals). The macrominerals include calcium, phosphorus, sodium, chlorine, potassium, magnesium, and sulfur. Minerals have different functions in the body. Calcium and phosphorus are particularly important for their role in skeletal structure. Calcium and phosphorus are important minerals to consider in your rabbit’s diet. You should consider both the amount of each of these minerals in the diet and the ratio of calcium to phosphorus in the diet. During growth and reproduction, the ideal ratio is two to one; while at maintenance, rabbits can utilize a lower calcium-to-phosphorus ratio. The ideal levels of these mineral are affected by the life stage of your rabbit. During growth and development and pregnancy, rabbits need higher levels of calcium and phosphorus to allow for bone development. Adult rabbits at maintenance require lower levels of calcium and phosphorus than at other life stages. They are able to absorb adequate amounts from the diet, and any excess consumed is filtered out by the kidneys and excreted in the urine. You may notice a white substance in your rabbit’s urine; this is excess calcium. If calcium levels are too high for too long, your rabbit may develop kidney damage and urinary stones. The ingredients used in commercial rabbit feeds should provide ample amounts of these minerals. Calcium is provided from alfalfa and alfalfa meal in the pelleted diet. Phosphorus is generally provided by grain by-products, such as wheat bran or wheat middlings. You need provide no additional calcium or phosphorus in the diet. 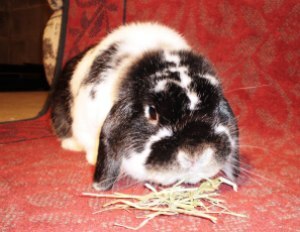 Grass hay is lower in calcium than alfalfa, making it more ideal for a companion rabbit diet. In addition, a high-quality diet provides all the needed minerals so that a salt or trace mineral lick is not required.